Apparently I am just the right height to ride this roller coaster I like to call the creative process. FACT: We are all the right height to ride this ride. It's that time of year again when I like to reflect on accomplishments and lessons learned, and to prepare for growth in the new year. I intend to keep up the tradition of creating an art journal page for each year's greatest lessons. This is a very timely distraction from a rather daunting transition that I'm preparing for. I needed a break. So I sit with my tea and old art journals revisiting my lessons learned from 2011 and 2012. I scroll through this year's blog posts gleaning out aha moments. Man am I glad I wrote it all down! This year's reflection feels especially significant. I am seeing strong connections between lessons learned in my creative practice- the art and writing- and lessons learned in my creative life- as in creating my life. Ah, that's where the magic happens. Reflecting back on my journey is like looking at a roller coaster from afar, where you can make out the slope of the tracks and predict the drops and twists and turns. This is hindsight, of course. Honestly though, I don't think I would have done much differently. My revelations came when they needed to, usually through those unexpected twists and turns. Mistakes were lessons, as always. 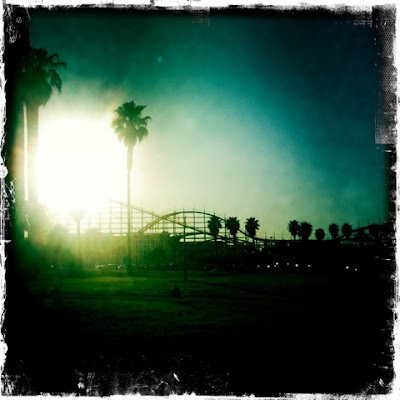 My 365 Days of Creative journey that began the summer of 2012 and ended this past summer, and the unexpected (but beautifully timed) spiritual journey that I embarked on after were both very much like riding that roller coaster- in the most thrilling, exhilarating, stomach flipping ways. I've been on this creative process/creative life roller coaster long enough to know that there will be ups and downs (and loopty-loops even). And I know from experience, the downs make the ups more thrilling. The ups make the downs worthwhile. And that's where the lessons are this year. This is creative gravity, people. It's the real deal! So what do you say? Are you up for the ride? I dare you to try it. Arms up, eyes wide.